The Great Southern Stamp Sale: How great was the great sale? We had the Great Stamp Sale yesterday. I was delighted, a just on 1pm all sorts of people started arriving, some who'd been to SERS in the past, and some who were new! Ellen and I got heaps of help setting up the tables, and there followed three solid hours of shopping! I couldn't be more pleased with what I took home (I'm going to play with them this afternoon). As a special treat, Ellen brought a box of samples she had made for shops, for magazines and for classes. We spent some time admiring her work. Here's one of Ellen's cool samples! She's not even a teddy bear person, but this is gorgeous. This is not MY haul. Not all of it, anyway. I added more later. Oh my goodness, I bought a lot. I don't think I was the biggest buyer though! Thanks to everyone who came, it was fabulous. You were good shoppers, and good guests too. 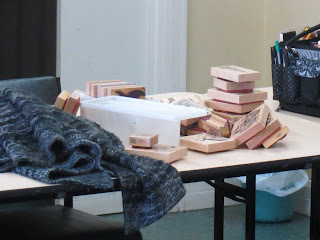 Come by SERS any time to have a relaxing time stamping, won't you? And - there are stamps left! A lot, and plenty of good ones too. So we're plotting the next move. There may be a return visit some other month. Stay tuned!